My dad’s birthday is the day before mine, so mid-July is generally “birthday week” for us! This one was a lovely birthday – got a pedicure, D took me out for a delicious dinner, and then he surprised me with Sleep No More! Fantastic! And over the weekend, my parents are coming over to spend the day. As always, any celebration must occur around food, so lunch is on the books. But it’s birthday week, after all, so I thought maybe something extra was called for. 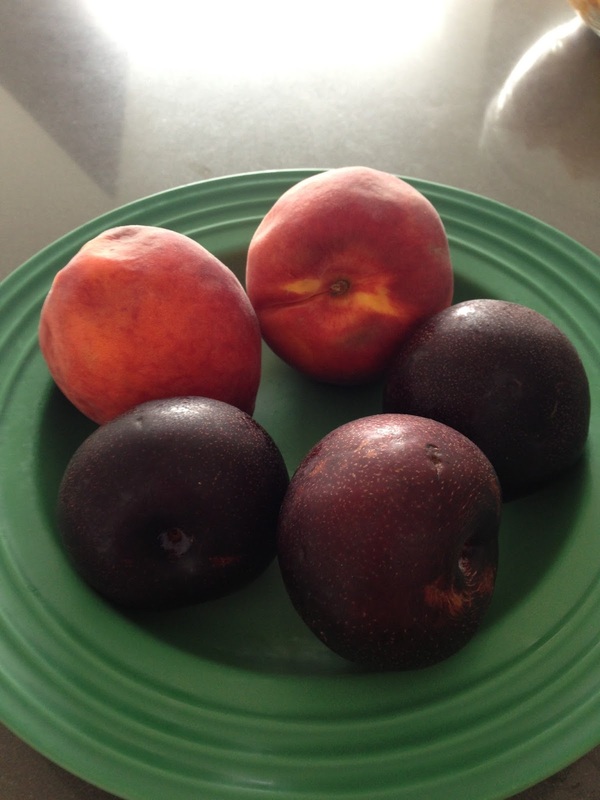 And look at these delicious peaches and plumogranates (have you ever heard of them?) that FreshDirect* had on offer!! Yum. Combine that with pie week on TheKitchn, and you’ve got a craving for a delicious peach pie right there. Of course what started with peach pie could only grow bigger, so right now I’m planning an “afternoon tea” with peach pie, blueberry scones, and cucumber-mint-cream cheese tea sandwiches. All rounded out with a pot of good ol’ black tea and maybe some pomegranate tea if we’re feeling fancy (aka if we want to do more dishes). 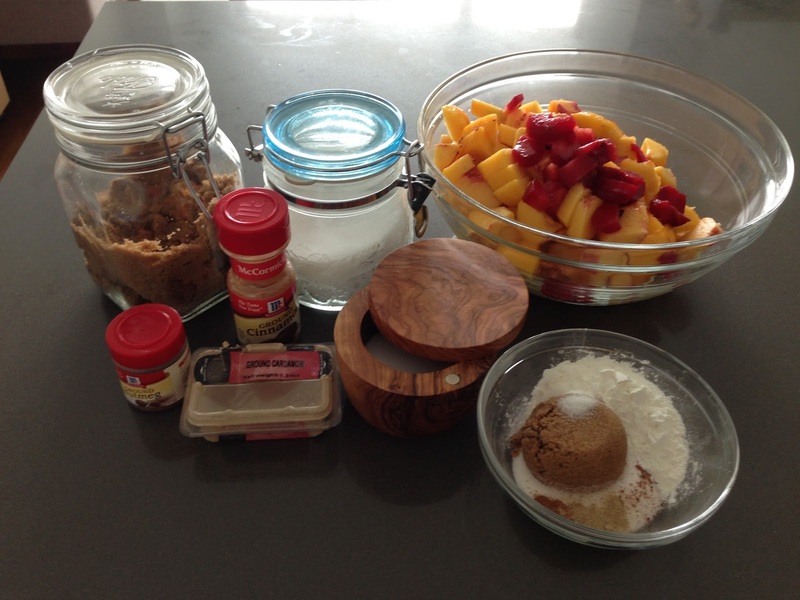 For now though, here’s the peach pie, filling adapted from Smitten Kitchen (with some tips and tricks from TheKitchn to keep it from getting soggy) and, since I haven’t yet graduated to that level of baking, pre-prepared pie crust from good ol’ Pillsbury. 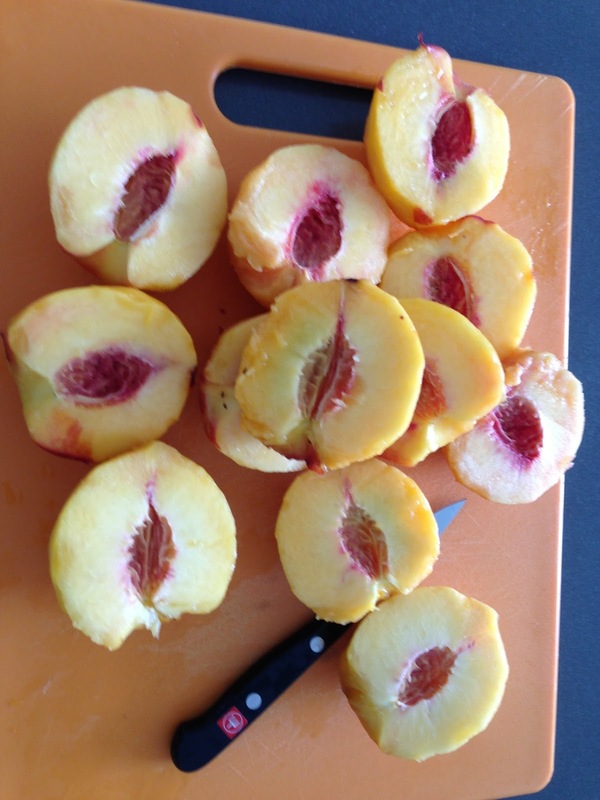 Peel, halve, pit, and cut peaches into 1/3 inch pieces. Mix all the dry ingredients together until evenly combined, and then mix in with the peaches along with the lemon juice. 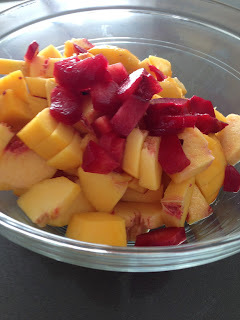 Store in fridge for at least half an hour so you can drain the juices. Drain the juices into a small saucepan, heat this up a bit so it becomes a liquidy (reduced) sauce. Pour the peach filling into the piecrust, pour the sauce over the peaches, and cover with another piecrust. Brush piecrust with a little cream (to give it a bit of a glaze) and pop it in the oven for 15 minutes. 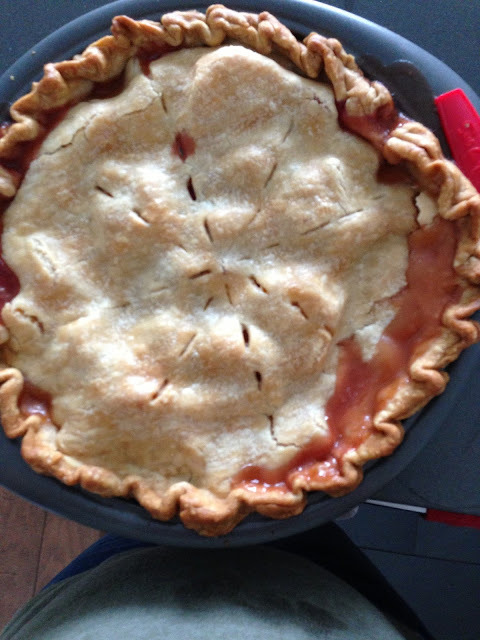 Reduce oven temp to 375, bake pie for 30-40 minutes until filling is bubbling and crust is brown. If crust browns too quickly, cover with aluminum foil. Let cool at least 3 hours. I’m letting mine cool for a day, because we’re going to cut pie instead of birthday cake! The finished product had a bit of overflow problems because I probably didn’t smush the top and bottom piecrusts together enough, but so long as it tastes good, it’s alright!